What a great week here at the PokerStars and Monte-Carlo Casino EPT Grand Final. Here are some of the moments we captured in some of the best tournaments of the year. Until next time! 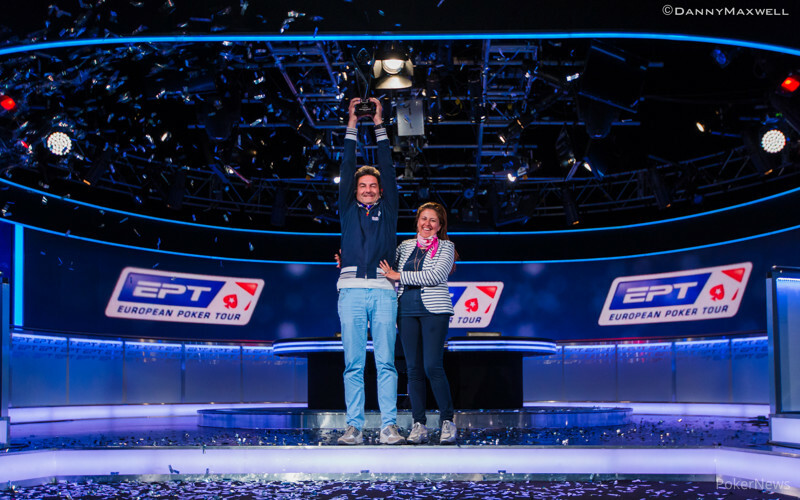 Antonio Buonanno Wins 2014 EPT Grand Final Main Event (€1,240,000)! It took over 300 hands, nearly 18 hours of play, and seven eliminations, but the 2014 PokerStars and Monte-Carlo® Casino EPT Grand Final €10,600 Main Event has finally come to a close. Capturing the title and the massive €1.24 million top prize was Italy's Antonio Buonanno — the only player at the final table not to qualify for the event online. The day was long, but eventful, and in the end it was Jack Salter and Buonanno left to duke it out in what would be an epic heads-up battle. The two traded blows, double ups, bluffs, and value bets for several long hours into the breakfast hours in Monaco, but Salter would end up in second place. After a failed float attempt followed by a long tank that resulted in a fold caused by the time clock running out on Salter, he was left at a 3-1 chip deficit to his Italian counterpart. Then, things were quickly over. On the final hand, Buonanno raised with the and Salter shoved with the . Buonanno called and held as the board ran out a rather uneventful . 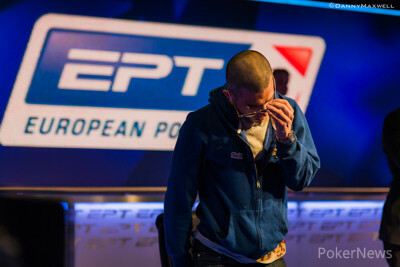 That concludes PokerNews' coverage from the final event of Season 10 of the EPT. It's been a great season and we can't wait to come back for more next year. Until the next time, we'll be catching some much-needed sleep! Hand #311: Antonio Buonanno had the button and raised to 600,000 with the . Jack Salter reraised all in for 4.95 million with the , and Buonanno quickly called. The flop came down and kept Buonanno in front without much of a seat. The turn delivered the and that gave Salter a few more outs to a straight. On the river, the hit and that was it. Buonanno had secured the victory, sending Salter home in second place and winning the 2014 PokerStars and Monte-Carlo® Casino EPT Grand Final €10,600 Main Event. Hand #309: From the button, Antonio Buonanno raised to 600,000 with the . Jack Slater moved all in with the , and Buonanno folded. Hand #310: On the button, Jack Salter limped in with the . Antonio Buonanno checked in the big blind with the . The flop came down and both players checked to see the land on the turn. Buonanno checked, and Salter bet 300,000. Buonanno check-raised to 900,000, and Salter called. The river completed the board with the , and Buonanno moved all in. "What the f*** man!" exclaimed Salter, not looking pleased. "So tilt." "How can you possibly be all in?" Salter asked after another few moments. "What the f*** man." Salter tanked with two pair while Buonanno sat motionless with the better hand, a full house. After agonizing over the decision for a bit — 4:35 to be exact — Buonanno called the clock on Salter. It wasn't brought in as this decision was for Salter's tournament life. Eventually, the clock was called after Salter tanked for nearly eight minutes. The entire clock ran out and Salter's hand was killed. Hand #305: Antonio Buonanno raised to 600,000 with the from the button. Jack Salter moved all in with the , and Buonanno folded. Hand #306: Jack Salter raised to 650,000 with the 2h}, and Antonio Buonanno called from the big blind with the . The dealer spread the flop, and Buonanno checked to his opponent. Salter bet 550,000, and Buonanno folded. Hand #307: Antonio Buonanno had the button and raised to 600,000 with the . Jack Salter three-bet from the big blind to 1 million with the , and Buonanno folded. Hand #308: On the button, Jack Salter raised to 650,000 with the . Antonio Buonanno called with the , and the flop came down . Buonanno checked, and Salter bet 550,000. Buonanno check-raised to 1.2 million, and Salter called. The turn was the , and Buonanno fired 2 million. With 5.6 million left, Salter folded and gave up on his attempt to win this pot. Hand #298: Jack Salter had the with 18 big blinds on the button and limped in. Antonio Buonanno checked with the , and the flop came down . Buonanno checked, Salter bet 325,000, and Buonanno folded. Hand #300: Jack Salter had the button and limped in with the . Antonio Buonanno had the in the big blind and raised to 900,000. Salter studied for a few brief moments, then folded, and Buonanno won the pot. Hand #301: On the button, Antonio Buonanno raised to 600,000 with the . Jack Salter folded. Hand #302: Jack Salter folded from the button. Hand #303: Antonio Buonanno folded from the button. Hand #304: Jack Salter raised to 650,000 with the and Antonio Buonanno folded. Hand #296: Jack Salter started this hand with the button. He raised to 650,000 with the , and Antonio Buonanno folded. Hand #297: Antonio Buonanno had the button, and he raised to 600,000 with the . Jack Salter defended his big blind with a call holding the and the flop fell . Salter checked, and Buonanno bet 500,000. Salter called. The turn was the , vaulting Buonanno in front with top pair, but giving Salter a flush draw to go along with his pair of sixes. After Salter checked, Buonanno bet 800,000. Salter counted out the chips and made the call. The river was the , and Salter checked to Buonanno's two pair. The Italian reached for chips and fired 2 million. Immediately, Salter took off his sunglasses and leaned back in his chair. "Ahh, f***," Salter said, under his breath. "Time," Buonanno said only moments into Salter's tank. The floor staff informed Buonanno that it had only been about 30 seconds for Salter's tank and that they would wait to put the clock on him. After another little bit of time, Salter popped up out of his chair and leaned hard on the table, almost right into Buonanno's personal space to get a close read. He then leaned back, began talking out loud to Buonanno, but the Italian just sat there motionless. The tournament staff didn't put the clock on Salter this time, although it had been nearly three minutes of thinking for Salter. Then, he called. Buonanno tabled his two pair, and Salter mucked. Hand #288: Buonanno folded his button. Hand #289: Salter had on the button and limped in. Buonanno checked his . on the flop and Buonanno check-folded to Salter's 300,000 bet. Salter now again in the lead. Hand #290: Buonanno on the button made it 600,000 with . Salter had and made the call. on the flop and Salter checked. Buonanno bet out 600,000 and Salter folded. "Bad flop" said Salter. Hand #292: Salter with on the button and opened for 600,000 with ten-five. Buonanno folded his big blind. Hand #293: Buonanno gave Salter a walk. Hand #294: Salter opened for 600,000. Buonanno made it 1,500,000 with and Salter folded his weak ace. Hand #295: Buonanno found on the button and raised it up to 600,000. Salter made the call holding the dominated and they saw a flop. on the flop and Salter checked. Buonanno bet out half a million and Salter folded. Hand #284: Buonanno had aces again heads up ( ) and opened for 600,000 from the button. Salter had just and folded. Hand #285: Salter opened for 600,000 with and Buonanno folded. Hand #286: Buonanno had and opened for 600,000. Salter had and made the call. on the flop and Salter checked. Buonanno bet out 500,000 and Salter reached for chips. With queen-high he raised it up to 1,450,000 and Buonanno instantly folded. Hand #287: Salter had on the button and with about even stacks, he limped in. for Buonanno and he checked. on the flop and Buonanno and Salter checked. on the turn and again both checked. on the river again check check. Ace high wins it for Salter.